An excellent day in St James’s Park. This was taken during the parade after the ceremony at the Cenotaph – Prince Edward is taking the salute. 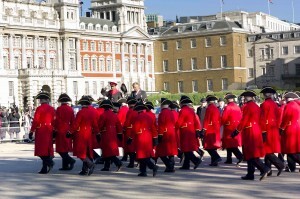 The Chelsea Pensioners are my favourite veterans. They’re local, they are resplendent in their red uniforms and each one I’ve met has been a thoroughly decent sort . We have so much to thank this generation for and cannot begin to imagine what they went through. I met one or two lost souls with sad stories today and I wouldn’t want to publish them in a public arena, as they are not my stories to tell. Suffice it to say, as I discovered when I returned home with two panda eyes, my waterproof mascara is not that waterproof.